Greetings in the name of God and Jesus Christ. I bring you blessings, my dear friends. The last time I talked about the difficulty of this path and the dangers of approaching it with the illusion that a few meditations and some miracle-formula will make all your earthly troubles disappear. It is equally far from the truth to overestimate the difficulties on this path. I can see that some of my friends have become a little afraid, and this unjustified fear serves as an excuse for the lower self that always wants to avoid purification and improvement. Now, my dear friends, let us examine the fears you may have. 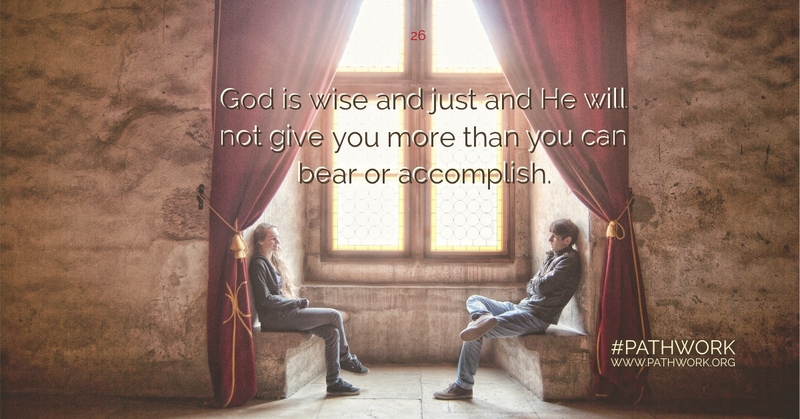 Certainly the path is difficult, but God is wise and just and He will not give you more than you can bear or accomplish. That, of course, varies with each individual. The higher your development, the stronger you are and therefore the more can be expected of you. But if you are still weak, perhaps the smallest effort will be sufficient for you. At any rate, none of you can truly achieve happiness in this life if you do not accomplish, spiritually speaking, the maximum according to your destiny. This path with my instruction and guidance should help you reach this end. Therefore, the proper attitude for you to take, if you happen to fear that this path is too much for you, is that you put yourself into the hands of God and ask Him. Let Him decide for you. But how very few people do this when the mood of doubt overtakes them! Then you are all very quick to make your own decision, albeit a temporary one in many cases, that this path is too much for you, and the thought does not even occur to you to ask God for His will in this respect. The truth is that this path of purification represents the foundation of your life. It is the ground you walk on, symbolically speaking! When you decide to take it, you simply shift the tracks of your life, if I may say so, into different channels. After a while, even though your main problems will not disappear from one day to the next, this has the effect of awakening in you a new life spark that furnishes you with a heretofore unfamiliar strength, acumen, vitality, and ability to enjoy life as you have never done before. Thus you will do better work in your profession; you will get more benefit from your times of leisure; you will get more pleasure out of life whatever you may do, whereas now life is still more or less flat for most of you. These are the results I can promise if you work spiritually in the way I am showing you. They won’t become apparent at once, but only after a certain time, after some inner victories. Then you will see that this path is well worth taking, even from your selfish point of view, and even though your main conflicts will have not yet disappeared. This is so because on this path you will eventually find out where in your deeper feelings, reactions, and thoughts, if not in your deeds, you have broken many a spiritual law. This realization will enable you to gradually change inner currents and emotional reactions, and this will automatically free a strength and life force that was previously locked or blocked. So I do not promise you a miracle that will be given to you as a reward from heaven, but show you plainly and logically that this path cannot help but work out because it is based on the law of cause and effect which works quite naturally and impersonally. So I ask you not to consider the decision to take this path as some additional activity in your life, such as taking up some new kind of lessons that might rob you of time and effort you could give to other necessary of desirable things. Consider rather this path as the foundation of your life; it is supposed to make it into a well-integrated whole. For if you can solve your inner problems and errors, as you can only do on this path, you must eventually also solve your outer problems. Because you have often wasted many lives, and because wrong habits of thinking and feeling have implanted themselves deeper and deeper in you from one incarnation to another, the knots have become tighter and more tangled. Therefore it must take time to dissolve these knots, to loosen them up, to understand the workings of all your inner currents in relationship to spiritual law and truth. However, if and when you have accomplished this to some degree, your outer problems must cease. This will certainly not happen when you merely put more effort and concentration on the outer problem alone, instead of finding out the corresponding inner problem which is always the cause of the outer one. By the same token, you will get so much more out of all the good things in life—happiness, joy, pleasure—if your soul becomes healthy again, if your inner reactions can conform to spiritual law. Only then will you be capable of happiness. For how many people are capable of happiness? Very few, my friends. The majority of people are actually as scared of happiness as of unhappiness. You desire great happiness, all of you, but the farther out of reach it is, the more desirable it seems to you; whereas if once in a while there seems to be a chance to actually realize such happiness, you then shrink away from it. Oh yes, my friends, this is so. Think back in your life; examine your feelings in these rare moments; analyze them from this angle and you will see that I am right. This is, of course, a symptom that the soul is sick and has deviated from one or more spiritual laws. For only those who follow a very important spiritual law, embrace life wholeheartedly, without fear, without self-pity, without being afraid of being hurt. And only those who can do so are capable of experiencing real happiness. So everything you do in life will have more flavor, more awareness, and more life spark if you follow the path of self-knowledge and perfection, and do what God wants you to do. It will not take more time than is reasonable according to your life circumstances. All of you without exception are capable, with a little willpower and determination and proper organization of your everyday life, to spend an average of half an hour a day on your spiritual development. You spend time on your physical body, feed it, rest it, and cleanse it; you certainly do not feel that this takes something away from your other duties or pleasures. You take it for granted that this is a necessary, self-evident part of your life. Yet, when the question arises whether to do the same for your soul—and less time is necessary for that than for your body—then fears, doubts, and questions bar your way. But they cannot do so if you take the trouble to think reasonably about this matter of spiritual development, my friends. You are not thinking reasonably about it, however because you do not evaluate these doubts as to their proper merit. Instead you have them because you are inspired by your own lower self. As long as you do not recognize how the lower self works, how it manifests, and in what devious ways it hides behind handy excuses, you will not be able to master it, regardless how sincere your love for God may be. Love for God is wonderful if it manifests in beautiful prayer and meditation. But the work has to be done too. What is the work? This is the work, my friends. To master your lower self is the work that Jesus meant mainly. To do good to other people is also part of it. But can you do really good to other people as long as your impure currents force you into thinking things that are not according to truth? No. You may be able to perform a good act and consider this a good deed. Yet it is not really a good deed if it is not supported by purified feelings. And purified feelings are your goal on this path, for which you do not need more than a certain amount of time every day, a certain amount of willpower, and a certain amount of detached and reasonable, common sense thinking. Some of you have really made this wholehearted decision. Some of you have not. But for both groups, it is important to understand how to deal with the lower self that works in the subconscious mind and sends only subterfuges to the surface. For even those of you who are sincerely willing to walk this path of purification will have many fights with this lower self of yours along the way. Perhaps not any more as far as taking this path on the whole is concerned, but about individual currents and trends within you which the lower self does not want to part with. So it is important that you train yourself to understand what is underneath these doubts or fears that want to lead you away from the path—or at least make it more difficult for you to gain the necessary self-understanding. So this is one factor, my dear friends, that you have to deal with in the first place, and keep in mind at all times. Learn to see through your doubts and your hesitancy; learn to see the real meaning of an occasional stubbornness when you do not want to understand something. And the more you come to know your own entire personality, what you really are and who you are, the easier it will become for you to overcome whatever is in your lower self that constantly draws you away from this inner work. Here are thoughts I could observe in some of my friends between the last lecture and tonight: “Isn’t it enough if I am a decent person? God loves us all and if I just try to be good and behave right, that should be sufficient. Why do I have to go through all this?” No, my dear ones, it may be sufficient for some people, but do not ever forget that for anyone who is guided to hear this, there is also an obligation involved. And this obligation means that more is expected of you than just being what is commonly considered a decent person who does not harm other people. That the fulfillment of this obligation works out for your own good, because by overcoming your lower self you free yourself of your own chains, is something else again. But let us remain for the moment with the argument that I have observed among some of you that it should suffice for spiritual development if you are good and do not harm others. What constitutes “harm to others”? To harm others is not only to steal from them, or to say ugly things behind their backs, or to kill, or anything like that. You may harm another person by not having enough love. And no outer and forced kindliness to make up for this lack will change the fact that this love is still missing in your soul. Or, you may harm another by not having enough understanding, by being blind. For if you are blind to yourself, you are perforce blind to your surroundings. And each individual fault of yours stands in the way of unfolding pure love, insight, and understanding. In this way you do harm others. But it is not as simple as all that, my friends. Imagine the love of God, this marvelous light that lives in the soul of each individual. And imagine how the lower self stands in-between you and this light and the beneficial effect it could have on your surroundings. You not only cause harm through actual bad deeds, bad thoughts, and impure feelings, but also by lacking the love and understanding you could be capable of having if you fulfilled your maximum potential in this incarnation. That means following this path of self-development. Not only those traits which are commonly called faults are a hindrance for you, and thus directly or indirectly harm others, but also your fears, which are not generally considered to be faults. You do not realize that your fears cause great harm, not only in your own life but also in the lives of others. Your fears also hide your light of love, understanding, and truth. So, being on this path is not only a matter of overcoming your character weaknesses. Overcoming your own fears is of equal importance, for as long as there is fear in your heart, you harm other people. You actually send out certain rays that have a very unsavory effect. Do you know that, for the spirit, fear has a very ugly smell? And do you know that your spirit, your subconscious mind, smells the fear of others all the time and is affected by it constantly? You can only guard yourself against this fear emanation of others and your own consequent negative reactions if you oust your own fear; for then you will consciously understand the fear of others and it will not harm you any more. You will make your instinctive awareness of their fear into an intuition that will reach your entire consciousness. But as long as you live instinctively, and therefore unknowingly, you remain unaware of all fears, you are gravely affected by them and thus you will, in turn, produce bad effects on others. Thus a vicious circle is set in motion that can only be broken if sufficient self-awareness and understanding is gained about these facts. If this is not done, the fears of others reaching you will increase your own fears; this sets up a hard wall between you and your fellow-creatures that eliminates all divine aspects that could be spread outward from your own soul, as well as from the souls of others. For there is nothing as contagious as inner currents, be they positive or negative. So do not believe that it is sufficient to be merely a decent person. This term varies greatly according to a person’s overall spiritual development and what he or she is capable of delivering in fulfillment and purification. I mean that God evaluates each individual differently. Furthermore, do not imagine that you do not harm anyone by simply refraining from the more obvious evil deeds. As long as there is fear in your heart you do harm in subtle ways that are not obvious, but are nevertheless just as damaging. Now, my dear friends, I want you to think about all that I have said to you. And, if you really want to follow this path, it is not sufficient for you to read this lecture just once. You will find that you will need to reread certain sentences several times and meditate on them so that you gain enlightenment and deeper understanding. Do not just read the lecture once and forget it. Some of these sentences have deep meaning for you personally, and therefore it is important that you work with them. Often it may be very necessary for you to go back to a few previous lectures, if there is any particular point which you still have not quite digested and still need to deliberate on. You yourself will know when this is necessary. I have promised to show you how you should go about actually starting on this path. There are many ways, and each individual reacts to them differently. Of course, in these general lectures I cannot give individualized or personal guidance for the manner in which each of you can work on this path. But I will give you certain basic facts to go by as you make your own plan. You do not have to work according to my words to the letter; certain details of method and timing may vary for each one of you. This can be all right as long as you keep the basic structure in mind. You all know that to gain self-knowledge is of imperative importance. Now, how can this be done? The first step will be to think as objectively as you possibly can about yourself, about all your good qualities and all your faults. Write down a list, as I have often advised, because this writing down helps you to concentrate on and condense what you have found out so far and will prevent your losing your hold on the knowledge. The written words in black and white can shed a new light of understanding, and promote a tiny little bit of detachment in your consideration of yourself. Later on, when you have gained further knowledge about yourself and about your subconscious trends, you will be able to combine certain factors of your first-found knowledge, provided it is clearly and concisely expressed. After you have done this conscientiously, the next step would be to ask someone else, someone who knows you very well, to tell you what he or she honestly thinks about you. I know that it takes courage to do that. Consider this your first effort to overcome a little bit of your pride. By doing so, you will have attained some victory that will already free you of one little inner chain. I would suggest, my friends, that all of you who are here, and all of you who read these words and cannot be present at these sessions personally but are also willing to walk this path, get together with one or two other friends who are interested in reaching the same goal. Some of you who read these words may not be able to belong to this group. If you are all alone in this spiritual quest, and wonder how to find the proper person to work with, I advise you to pray for guidance. You will see what happens. For whoever needs help and knocks on the door, knowing how to ask, will be answered. I can promise you that if your wish is sincere, you will be guided. As far as my friends who are here are concerned, you should not have a problem because you can always arrange to get together with one other person here and perhaps meet once a week to discuss things pertaining to your work on this path. For, in many ways, it is very important not to do this work completely alone. In the first place, you then align yourself with a spiritual law, my friends. To really open your heart to another person brings spiritual help that you could not receive by yourself. It is due to the law of brotherhood. For people who are always alone, no matter how hard they work, no matter how intelligently they read or study, no matter how much self-honesty they try to have, become locked in a certain vacuum that bars a complete understanding and evaluation of the self, an understanding that automatically flows into them if they can open themselves to another soul. By remaining all alone, you violate the law of brotherhood in some subtle way. Not isolating yourself requires a certain amount of humility which does not come easily at the very beginning, but after some time it becomes second nature through a fruitful cooperation with another person. Soon you will be able to talk openly about your difficulties, your weaknesses and your problems, and receive criticism. The latter, of course, is equally healthy for the soul. Each one of you who has already tried opening up will confirm that merely discussing a problem you have kept to yourself without hearing good advice, will cause it to all of a sudden lose its exaggerated proportions, and some of its fearful aspects. Being yourself as you really are with at least one person, with the minimum of masks and defenses possible, you imbibe a very healthy medicine for yourself. At the same time you offer an act of love to the other person whom you help more by showing your own human weaknesses than by trying to appear superior. Your partner or co-worker will do the same for you. So try to organize this with each other. You will see after a while how helpful and fruitful this will be. It will give you food for thought; you will help each other and you will learn a lot in brotherhood, in humility, and in detached understanding. Asking others about your faults may not always be possible with the person you have chosen as your spiritual co-worker, because not all people who come here know each other very well. Your own friends or family may not share your interest in this work, but they still know you very well and can tell you more about yourself than your new-found friends here. I would advise you to ask those who know you really well. No matter what they believe, they will respect you for your sincere endeavor to improve, to learn about your faults, and for listening to them. You can ask in the right way, explaining to them that four eyes often see more than two, and that you want to improve and will not be hurt or angry with them even if they say something that may seem unjust to you. My friends, you know it is possible that by doing just that much, you can open a door to the very people you had hoped to convince and were unable to reach by merely lecturing them, by trying to prove a truth they could not see as yet. When your friends or family do tell you your faults, think about them calmly. Someone may say something that at first will seem entirely unjust and hurtful to you. You may also, for that matter, be even more hurt if a truth is told to you. Even if you have the sincere conviction that the criticism is an injustice, try to evaluate it nonetheless. There may be only one grain of truth in it; the other person may just see you a little differently or see you just on a superficial level. He or she may not have the full understanding of what lies underneath, why you react in this way, and all the complicated mechanisms of the workings of the soul. He or she may not choose the right words. But the one grain of truth in what is said may open a new door of understanding for you. It may not even be something entirely new for you, but it is often necessary to consider the same fault or trait from new angles, under a different light, so as to understand the various effects this same fault may have on your surroundings. When you say your daily prayer and do your meditation, this is what you should concentrate on. Perhaps it is better for you now to devote less time and concentration to general deliberations, and instead ask God for help to be able to recognize yourself in truth, without the distorted view the self generally reserves for itself. Ask God to inspire you how to react rightly to enlightenment about yourself; ask for help to receive unpleasant truth from others in a productive way. If you start in this way, you have made a very good beginning. If you take all the faults you are beginning to recognize more and more clearly into your daily meditation, and if your wish is truly sincere, you have made the best beginning imaginable. And, my dear friends, if you do that, train yourself to observe your inner reactions when you deal with the unpleasant within you. This is of utmost importance. I have begun this lecture by saying that the lower self constantly resists your endeavors. Here you have a wonderful opportunity to observe your undisguised lower self as it works and reacts. Try to watch it as you would a third person. Try to be a little less involved in it. Try to put a little distance between your powers of self-observation and the reaction of your lower self, your ego, your hurt, your vanity that become involved when you are dealing with the unpleasant side of your personality. By thus recognizing your own reactions and understanding them, perhaps humoring them a little and not taking yourself so deadly seriously in this respect, you will gain another step up on the ladder. But I admonish you not to expect this awareness to happen from one day to the next. It means constant work, and after some time of regular work each day, let us say for only half an hour, you will make progress. You will come to the point when you feel quite clearly the distance between the real you and your hurt little ego, and you can humor it a little bit without being so very much in it. Once you have accomplished this, the door will open for further self-understanding. This might be a very good way to begin, dear friends. Those of you who have not found as yet the right co-worker, as we might call it, can pray for guidance and you will be helped. Then get together once a week and tell each other what you have accomplished so far, where you still have difficulties, what your inner reactions are, and perhaps plan together what pertinent questions you may ask in the next general session here. This will also give great joy to you. So, begin by making your own inventory of faults. After you have done your best in this respect, and have also asked someone who knows you really well about your faults, compare their observations with your own findings. Complement the two lists, work with them. Take the results to God in your daily prayer to help you further. These efforts are a wonderful beginning for everyone. They will not be in vain, I promise you. If every day you do some self-observation work, and meditate on some of the pertinent words I am giving here, you will certainly be successful, long before actual results can manifest in your life. A feeling of deep contentment and peace will come to you often, that only those who work on themselves according to God’s will can have. On a day when you feel strong, alive and full of enthusiasm, it is much easier to find contact with God and His truth within yourself. Consider such days a source of strength that you can gather for the more difficult times that may follow. Most important, however, are the days when you feel low and discouraged and doubtful. Then it becomes imperative for you to know how to fight against giving in to these moods. Choose these days to reread what I am saying here and consider it again, and take your problem to God. It is most difficult for human beings to form the right thoughts at the right moment. The practice of this is a training in itself. To have the proper thoughts at the proper time is really nothing else but a habit that has to be formed. So if you are low and discouraged, do not give in to your mood so easily. Ask God for proper understanding and light in this moment. Perhaps you could make a mark on your copy of the lecture and put it in a certain place where you can easily find it. Then, if you still doubt, ask God for His truth and His will for you; ask Christ to help you to be receptive to it. Pray: “Father, is this thy truth? Is this thy will for me? I am open to receive thy answer.” Nothing more is asked when you are in doubt, my friends. But if you do this sincerely, with your whole heart, and disregard the resistance of your lower self that always lurks nearby in such moments, then you will have gained a major victory. I want to impress this upon you; take it with you tonight as the first actual and concrete beginning on this path. Before turning to your questions now, I want to mention once more that everything you suffer from in your life, my friends, results directly or indirectly from your shortcomings and from your fears. If you did not have any shortcomings, there could not be any fear in you. It is fear that makes you so miserable, the same fear that makes you blind to the joys of life. Remember that it is in your own power to break the chains of fear by following this path. It is in your own hands. If you wish for this power, you will receive it. No matter how busy you are in your life, you will have the time, not only to fulfill your duties as you have done before, but to fulfill them infinitely better. And you will have time to enjoy life infinitely better too when you lose the constant fear and insecurity in your soul. It spoils everything for you so much, my dear ones. Do not think you will lack the strength for the necessary work on this path. This strength will be given drop by drop for all your needs, spiritual and material, when you first decide to choose this path and trust God that He will give you what you need for it. And now, my friends, I am ready for your questions. ANSWER: By “meek” are meant all who have no hatred, no resentment, no self-will, and no fear. They will be able to be understanding, loving, and humble enough not to have to prove themselves right all the time. Many people may lack the courage to put this in practice, but inside they feel frustrated when they are not able to do it. To be like this is to have a very healthy soul, because this means having strength, power, and independence. Such a person lives with the divine law that works for him or her, instead of swimming against the stream of the law which then sets up very disharmonious currents. On the other hand, it should be clearly understood that meekness in the way Jesus meant it does not mean that you should let the lower self of your brother triumph. Oh no. Jesus Christ himself has not done so. Jesus Christ has fought many a time, and often quite strongly. To fight evil in the other fellow, as well as in yourself, also includes being able to accept a hurt, and perhaps learn from it. But you must not allow the lower nature of others to take advantage of your meekness. Finding the right course between these apparently contradictory courses of action is not as difficult as it may appear at first. Test yourself first where your own ego is involved, your pride perhaps or your self-will; right then and there you should learn to accept humbly that your ego prevents your seeing the truth. The fighting spirit that then arises should be curbed and only allowed to function if the ego can be neutralized. After a while, with proper self-development, objectivity and impartial judgement are attained. If you can clearly feel how your ego is gradually disappearing, and you are not in the center of your own universe anymore, you will be able to stand up for a right principle and know how to fight in the right way. Of course, this cannot happen as long as you allow anything that touches you personally to influence your course of action. When your small ego stands in the center, your judgment is always colored. Until you can clearly distinguish if your ego is still involved and to what extent, you will have to accomplish some work on this path. For quite a time you will find that your reactions, your feelings and your views, even on quite general subjects, are at times colored by your own personal ego-stake. Not to have this ego in the foreground any more is to have the humility we are always talking about. This is the meekness Jesus mentioned. This humility alone will make you really strong and give you the power to distinguish when to keep still after a personal hurt or injustice and quietly forgive, and when to stand up and fight against something evil, whether or not it touches your life. To come that far, you have to be a keen detective of your most hidden feelings and their true nature; you have to train yourself to acquire the strictest possible self-observation. QUESTION: How do the different main religions continue their activities in the spiritual world? Do they fight each other? And how far can they influence human beings? ANSWER: In all the spheres, and in every gradation within them from the highest to the lowest, the different main religions are represented. It is self-explanatory that they work differently in each sphere, according to the height of their development. Let us begin with the highest spheres. There, the different religious denominations also have their own organization, but in a very different way from what is often imagined by human beings. Those in the highest sphere know the real truth of the unity of all, as well as the falsehoods and truths of both their own religious groups and the others. They continue to work for the Plan of Salvation within their own group because they have their tasks to fulfill. If spirits of the highest spheres did not also come to earth within the different religious organizations via certain people of a particular church, the Plan of Salvation could not function properly or efficiently. By the same token, very high spirits also work and inspire groups, nations, and individuals who are not bound to any religion. There is so much to be fulfilled in this great plan that often has to be done through and around existing conditions and blindnesses. Without such incarnations in different churches and groups it would be impossible to tear down falsehoods. Truth has to grow slowly. Any religion on earth, therefore, will have emissaries born into it from all spheres who belong to this particular denomination. They are ranged according to the development and the desire of the individual in question, and also according to their openness to truth. Thus, the measure of inspiration always depends on the person. You are always inspired according to your aims and attitudes. In the highest spheres the spirits plan with a long view, knowing that their inspiration has an ultimate purpose that can rarely be understood by human beings. The spirits cannot overcome the human dogmas; unless those people heard the truth from highly developed incarnated spirits of their own religion, they would not be open for any inspiration, because their minds are too strongly set. Whenever this is the case, the doors are closed to inspiration coming from the spirit world. Nevertheless, enough sincere good will may be present to enable the spirit world to do good. God’s spirit world needs workers in all groups, in all religions, to attain the one great aim of final unity. We know that this unity cannot be accomplished as yet, but we work best for this goal not by trying to destroy, but by building upon that which counts. In God’s world, therefore, the different religions certainly do not fight. They all have the same goal. They know the limitations of spirits of lower development, and they try to slowly eliminate these limitations by building upon what is constructive. However, in the spheres that do not belong to the world of God as yet, conditions are different. There the various religions do not fight either, because they do not have an opportunity to do so for the most part. There may be an exception in an individual case that is too complicated to explain here, but as groups they have their own spheres and remain there. I have often told you that in the spirit world you live among spirits of your own kind. That diminishes friction, but also the possibility to advance. Let us take the case of human beings who have fervently believed in one particular religion. In many ways they are still imperfect and therefore cannot reach higher spheres after shedding their bodies. When they enter the spirit world they will always be surrounded by spirits, both higher and lower, who are compatible with them and therefore belong to this religious group. The higher spirits may be trying to give certain advice or hints about personal errors, as well as about the errors of their convictions. But if these happen to be stubborn people, very much indoctrinated with their own beliefs, they will not be open for such words and will reject all advice and hints as untrue. Since free will is never violated, these people are free to go with those spirits who have not changed their own beliefs. They would do so even less in the spirit world than on earth; in the latter case they at least had the knowledge and opportunity of seeing other means of reaching God and of learning something from that. But in the beyond they live in their own world, and it may take a very, very long time to change their views, particularly if, due to their personal convictions, they are incarnated again into the same surroundings. Some spirits in these spheres may be a little disappointed that their world is not more beautiful; but then they may also realize, and rightly so, that this is due to their own imperfection and has nothing to do with their religious belief. Only at a later state of purification does it occur to them that stubbornness and narrow-mindedness are at the core of their lower self, and these traits, among other things, were responsible for their one-sidedness. As long as this stubbornness exists, no one of you can receive inspiration for something that may be contradictory to your own stubborn convictions, unless it is through an act of God’s grace that may only come in rare instances. Such grace has to be earned in other ways. As I have often said, it is possible for a person or spirit to develop in every religion. Only if a certain point of development is reached, will the realization dawn that all truth meets finally in one universal form. When you have reached this awareness, you will see that there is no division among religions; there is no longer any attitude of “only this way is right and all others are wrong.” You will then see the many errors of particular religions, and still work with the truth. QUESTION: What happens after death to a person who was an atheist, for instance? ANSWER: There are spheres for every possibility. You know very well that the issue is not so much what religion you believe in, but whether or not you fulfill the best that can be expected of you in your incarnation. If people are atheists, they will be judged according to their accomplishments; the same applies to everyone, of course. These accomplishments are measured individually according to one’s previous incarnations, merits, omissions, and so forth. People may have been atheists and still have accomplished something; perhaps they have overcome a particular weakness or a hatred against someone sharing their last incarnation and this counts in their favor. So those people will be in the sphere that belongs to them. They have built with their feelings, with their thoughts, and with their general and particular attitudes. You tend to forget, my friends, that the spheres are not out there and you are not put into them. The spheres are your own creations. You build them, and whatever you have built is your sphere, your temporary home. QUESTION: I always thought that atheists remained in darkness because they are separated from divine light? ANSWER: Yes, this is so in most cases. But here too, one cannot generalize. There may be an instance where an atheist is not in darkness. He or she will certainly not be able to live in a sphere of bliss, beauty, and divine harmony, but they do not have to live in dire misery either. It depends on so many considerations, my friends, for the judgment or the evaluation of a particular case is entirely relative. Beings who are still very undeveloped have much less expected of them. Let us take for example souls who are still very young, who have only had a few incarnations. Their instincts are still low and coarse. Now such people may be tempted to give in to these instincts and perhaps kill someone. If this temptation can be overcome, even though such people do not believe in God, but have merely some sense of decency, their souls will have earned great merit. This may be more in their favor and may be of infinitely greater merit than what people of higher development acquire. What counts is the effort to overcome one’s lower self. Whether the lower self still contains such dark trends in a younger spirit, or whether the lower self simply contains the faults, weaknesses, and sick currents that any of you possess, is immaterial. The effort counts. Therefore, atheistic souls such as the ones I mentioned here will have some light in their sphere, some bright spot that signifies open encouragement or a certain strength that will flow into them in their next incarnations. In the spirit world evaluation is never general. It is always strictly personal, and judgment is passed on all personal considerations. Everything is taken into account, and therefore judgment is always completely fair. For human beings this is hard to imagine, since you tend so very much to oversimplify and generalize. Now I will retire into my world and will leave you with God’s warm blessings for each one of you. Next week you celebrate Easter. It marks the time of the greatest sacrifice that has been made, my dear ones. Think of this sacrifice these days with particular gratefulness. It was done for each and every one of you without exception. Take the strength with you that was given to you this evening. May it fortify you, and may it fill you with love and courage. Go your way in peace; be in God!